If boho is the new black then Chris and Tash of Grá Agus Sonas Creations are black velvet. Their business making macramé wall hangings and planters in Ireland is deliciously modern bohemian with rustic foraged driftwood and shells bringing a personal eclectic touch to each piece. We met on a drab February morning but the inside of Chris's home is bright and refreshing. Tea and biscuits with marshmallow centres? Ah, go on then. There is no stopping Chris and Tash who founded Grá Agus Sonas Creations in 2017. Since then they have hit the Dublin creative scene in style. With a range of plant holders and chic wall hangings, their creations are already gracing the walls of homes here in Ireland and as far afield as America. As old friends there is a certain comfort in bouncing ideas off each other and a wonderful lack of humility. Learning a new craft, launching a new business and being prepared to flaunt it, this is knotting with intention. I am smitten and want to fill my car with divine creations to transform my own home from normal to gloriously styled. Thank you so much Chris and Tash for sharing your inspiring story below! Visit their Etsy store here or follow them on Instagram to see when they will be popping up at market stores in Dublin. - Can you tell me a little of your backgrounds and how Grá Agus Sonas Creations came into being? We are both from Rush and have lived here all our lives with the exception of some travel and stints living away. We met in 2nd year at the local secondary school and have been friends ever since. Tash – I had worked in the financial services industry for 16 years, which I fell into when I lived in Jersey in the Channel Islands. I moved home in 2008 and continued on this path. In 2017, I graduated college with a BA Honours Degree in HR Strategy and Practice. My aim was to change career, but after falling ill I decided to give up my career in the corporate world altogether - for what, I wasn’t quite sure! I’ve always been quite a creative person but never really explored it in any detail, let alone consider it a career option. Chris and I have had many conversations over the years about setting up some sort of business venture together and there have been many wild ideas. It wasn’t until her wedding where our creativity really came to light and we started the conversation about starting to making a craft to sell at craft markets. The next question was which craft? 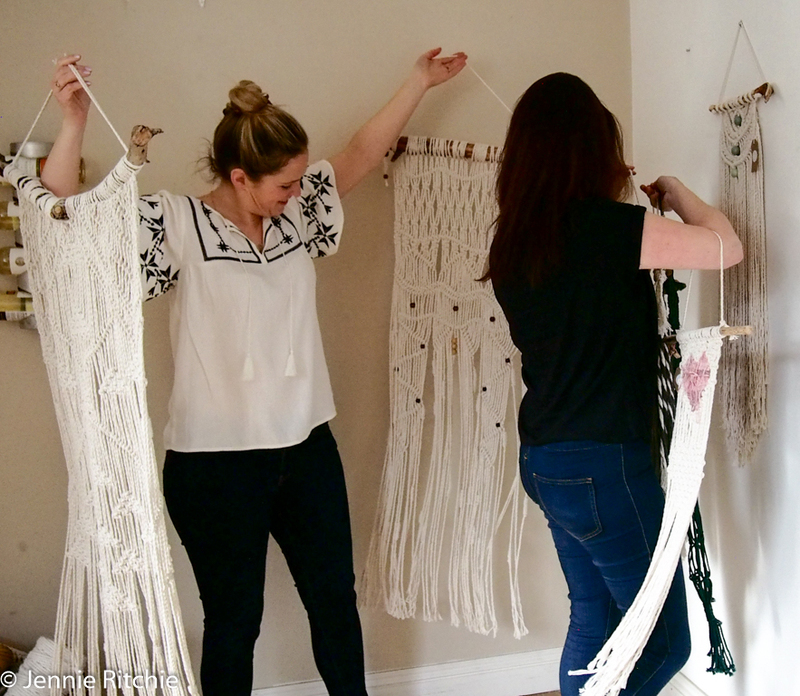 Chris had come across macramé when she was looking for wedding ideas and we both fell in love with it. So we booked ourselves onto a macramé workshop and then, over a bottle of prosecco, we decided we were going to give this a shot. Chris - I’ve worked in many different types of jobs from a shop assistant, a fruit picker, hotel housekeeper, a garden landscaper, a wedding photographer, a project manager for an office moving company, to my last job which was in the funds industry. I’m extremely grateful to have had so many different experiences within my work life, but always struggled to find something that I was passionate about. I had always thought you should have a 9-5 Monday to Friday job to be successful, therefore I could never settle. I never really allowed myself to totally embrace my creative side until last year when I got married - my husband and I decided to have a home wedding so we could have total control over what we wanted. I realised through spray painting bottles, creating wall hangings for the marquee and turning an old barn into a Sibin bar, that I loved it. I loved allowing myself to be as creative as I wanted to be and felt a sort of freedom that I never felt before. During this time, we discovered Macramé. So, with a lot of research, we eventually found a workshop in Dublin and Tash and I decided to go along to it. We were totally excited by it. Being able to create something from a piece of rope felt so organic. So, with a lot of thought, we decided that we wanted something different for our lives. I happen to think that everything we have been through in our work and personal lives, brought us to this point. We were ready for it so we took the leap. I handed in my notice and we started up Grá Agus Sonas Creations. - For the non-Irish readers, what does Grá Agus Sonas Creations mean? Can you tell us about your designs and the inspiration behind them? Our name means ‘Love and Happiness’ its takes its origin from words that mean the most to us. It also represents what we want to feel from creating each piece and what we want our customers to experience when they own one. Tash – I chose the word Grá meaning ‘Love’. For me this represents many things, not just the conventional love between a couple or the various relationships in our lives, but love for life itself, to see love in everything and everyone and most importantly self-love. I believe love is the highest power and an incredible force in all our lives. Chris - Sonas means Happiness. Happiness is my mantra and has been since I was very young and I try and live by it daily. I believe in the laws of attraction and whatever you put out into the world you get back. So, happiness to me is allowing myself to be creative, to be in fun, happy, positive environments and being around the people that you love. - How did you make the leap from having ‘jobs’ to working for yourselves? Tash – It’s been an interesting experience, I’ve been used to a very structured 9-5 routine, commuting in and out of work every day and working in a large busy office, thankfully I don’t miss it. Working for myself is very liberating and exciting, but of course at times scary and daunting and can be a challenge to know what to do next, you worry about finances and whether people will like your creations, but if you don't try you will never know. Chris - The leap for me was difficult at the start as I struggled with myself and thought how were we going to survive financially and all those things we tend to overthink!! After a lot of conversations, research, a talk with a life coach and having such amazing support from my husband, family and friends who have always encouraged me to follow my dreams, we went for it. I know we will be fine and that this business will flourish, as we are both so passionate about it. Sometimes when you get that feeling in your belly you just have to go for it. The changes I have noticed in myself have been so worth it, I feel free, alive and so happy within myself. Of course, there are times of worry but that just drives you forward and makes you work harder to make it a success. The one thing that we will always have is that we can always look back and say we tried and what an amazing adventure we had doing it. - Is Grá Agus Sonas Creations your full-time business now? What steps are you taking to grow the brand as a business? Tash - Yep it sure is. It’s two-fold, you’re constantly trying to grow and expand your own creative abilities and then try and be smart at marketing and growing the brand. I’ve always been allergic to all forms of social media, so promoting myself in the public eye is something I have to work on, Chris is definitely better at it than I am!. In saying that, social media is very powerful and an amazing platform for small businesses, we wouldn’t be having this interview without it. We are extremely grateful for every person who follows us, likes our work and shares our pages. Instagram is our primary social media outlet, as well as Facebook. We now have an Etsy shop set up and have started seeing orders coming through that, we only sent a piece to New York last week which was fantastic. We are contacting small local craft retailers to see if they would be interested in stocking our work. We are also linking in with local businesses to display our pieces. We’ve contacted interior designers and magazines to see if they would be interested in featuring our pieces in photo shoots etc. We are in the process of registering with the Crafts Council of Ireland. We are speaking to the local enterprise board who are great at running various courses, such as start your own business and social media, to name but a few. We continue to try and secure places at various craft fairs, so we can meet our customers and enable them to see and touch our pieces. We did the Dublin Flea Christmas Market which was fantastic and gave us the bug. This whole journey only began last September, so we are navigating and learning the art of branding as we go. - How does a typical day in Grá Agus Sonas Creations look like? Tash - There is no typical day that’s the best thing about it! It does start with making sure the dogs are walked though, then it’s either work together from Chris’s house which is where we keep all our materials, or we can work separately from our own homes. The dream would be to have an independent workshop/studio, so if anyone has any space they have lying idle we’d love to chat to you!!! - Who is the photographer behind all of your lovely Instagram pics? Have you got a photography background too? Tash – We use our iphones to take many of the photos on Instagram along with props from both our homes. However, Chris is the professional photographer and often has to take out the ‘good’ camera to shoot when we have very little light during the dark winter days and she always does a fab job. We don’t have a studio to shoot in, we get creative in the rooms of our homes to display the pieces. Chris - I have always loved photography. I was always the one who had a camera in my hand and who now has all those embarrassing teenager photos of everyone! I went on to do a course in photography in Griffith College and from there, along with a friend, we set up a part-time family portrait and wedding photography business. We did this for many years and then, with growing families and different job opportunities, we decided to part. I haven’t really picked up the camera since then. I felt I needed a bit of a break from it until now!! Which has been really nice. I really enjoy setting up the scenes and showcasing our pieces. - Is Ireland a good place to set up a creative business? Is there a lot of support and where so you go to find it? If the Christmas Flea market is anything to go by, there is a very high standard and variety of crafts people now in Ireland. Through researching craft fairs we’ve noticed there is more popping up and they are becoming increasingly popular. There is a wider variety of workshops available which goes to show people are interested in crafts. The Craft Council have a huge amount of information and support for up and coming designers. The local Enterprise office are also an excellent source of information on how to grow the business. From talking to customers, people are definitely interested in finding a unique handmade item that they know has not been mass produced on a production line. - Where do you sell your designs? We sell online through our Etsy store, through Instagram and Facebook and at craft fairs. - How would you describe the style of the designs in Grá Agus Sonas Creations? Where so you source your materials? Working with rope creating patterns feels very organic so I suppose our pieces would also reflect that especially when we use the natural cotton rope and a piece of driftwood. The great thing is that we both have different styles so different pieces can speak to different people. The charm of our pieces is that no two items are exactly alike; each piece is a creation of our own style mixed in with a century old craft practice. Sourcing materials is actually quite difficult; we’d love to source from Ireland but at the moment we can’t find a supplier, so the majority of materials come from the UK and the US. We are blessed however to live next to two beautiful beaches where we source our driftwood and shells. - You live and work in Rush, Co. Dublin – where are your favourite spots to go out for a coffee or a night out? For coffee, it’s got to be Skinny Batch which opened last year - Sharyn and her team are doing an amazing job bringing great coffee and tasty deli delights to Rush - long overdue! We have lots of nice places to eat, our usual haunts are The Harbour Bar, D’Vine at Jack’s Bistro, and Karma Thai, but there’s loads of other good choices too. Nights out - we tend to do more nights in now with friends! - Where are your favourite places to go at the weekend to escape for a while? Tash - usually spent bringing my daughter to her various hobbies, but outside of that finding a market to potter around, going on walks, going to the pictures, spending time with family. Chris - I enjoy walking the dog across the beach, a hike in the Wicklow Mountains when it's fresh out. Also I enjoy a fire, a good movie and a bottle of red on the couch! - Do you have any other hobbies (or time for any hobbies?!) outside of your creativity? Tash – I love walking I walk everyday and my favourite place to go is on the beaches in Rush. I love to cook and explore new tastes especially with vegetarian food. I love doing craft with my daughter, we are always creating something. I enjoy oil painting. My other passion is Kundalini yoga and meditation. Chris - I’m a big foodie so I enjoy cooking and trying new recipes out. And when we can, I love going into Dublin city to scope out a few places! I love music, going to concerts and especially festivals and the freedom they give you - the festival bubble! My husband and I really enjoy travelling and try to explore new places when we can get away. Our favourite place in Ireland to visit is Kinsale, I love all the arts and crafts shops down there and all the restaurants especially the Black Pig Wine Bar. I have a thing for gardening although if you look at my garden now you wouldn’t think it but I love it, I find I get lost in my own world when I go to it and that could last hours. - There are two of you working together, do you argue over what music to play while you work?! To get around that we just listen to Newstalk! - Does your sense of style pervade through your home as well as your work? Tash – I had never really thought about it but yes I suppose it does. I love soft colours and art pieces; I try to get a piece of art from places I visit. My home is definitely more cosy country style than a modern minimalistic style. Chris - I suppose it does! I love pottering around craft shops and flea markets and picking up different things and I’m also a big fan of upcycling old furniture too! Whenever we travel I also try and pick up a piece of craft from the area that we are visiting. - What other creatives inspire you / do you follow on social media / magazines / blogs / etc. Tash – I’m inspired by so many things, if you were to look at my personal Instagram account you’d see I follow other macramé makers and textile artists, but I also follow things like discovering Ireland, foodie pages, lots of different yoga, mental health campaigns, holistic & spiritual healing. I’m a big believer in the law of attraction and gratitude. Over on the Grá Agus Sonas Creations page we follow some amazing artists and craftspeople. Chris - All creative’s / entrepreneurs inspire me. People who are following their passions and creating and sharing their work with us. I think sometimes for creative people it’s hard to showcase your work at first, as you don’t know how people are going to react to it. So it’s great to see and learn from their journeys. I would follow a lot of people who create macramé and weaving pieces on Instagram. Also a lot of Irish designers such as Ail and El Design, Wildbird Studio, Fiona Bulfin Textiles, A little Idea, Sam agus Nessa, Three Little Birds, just to name a small few. There are just so many wonderful Irish designers and artists around. We really are a country that is full of inspiring people. For interior ideas it would be House & Home, Image Interiors, Gaff Interiors. I would also be lost without my monthly Easy Food magazine too! Totally Dublin would be another one I like to pick up and have a read with my coffee!